Carys’ father, Dr. Gary Parker, is a maxillofacial surgeon who has worked with the Mercy Ship organization for 26 years, transferring to Africa Mercy (the world’s largest civilian hospital ship) in 2007. He met his wife, Susan, at sea, and they have two children, Carys and Wesley. Africa Mercy travels from port to port along the African coastline and treats those who have no access to surgical care. Dr. Parker specifically removes severe facial tumors and brings smiles back to disfigured faces. Aboard the ship, Carys grew up surrounded by crewmembers from more than 35 nations. She attended school aboard the ship and volunteered her assistance, caring for and spending time with the patients. During her junior year of high school, her parents began discussing several college/university options with her. After meeting with Whitworth alumni and hearing good things about the university, Carys chose to attend. In addition to evidence of the university’s strong academic programs, says Carys’ mother, Susan, the praise for Whitworth that they heard in conversation also drew the Parkers to the Spokane school. .
“We come from a small shipboard community, and we know that the quality of the community is directly related to the quality of the product – whether that be healthcare or education,” says Susan. Though currently undeclared, Carys is interested in studying theology at Whitworth. She says that she is eager to grow in her ability to articulate God’s redemptive plan in ways that are culturally relevant. Watch the 60 Minutes segment on the Africa Mercy and her crew here. Watch the 60 Minutes segment on the Parkers here. Africa Mercy, which launched in 2007, is home to 400 crew members and 90 patient beds. 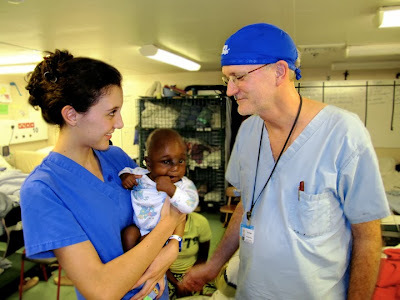 This ship is a Christian charity that treats patients of any faith, and crew members pay their own way. The Parkers are sponsored by friends and churches – including John Knox Presbyterian Church, in Seattle.